I wanted to write a blog post on a series that I am completely addicted to. I usually am not one of those people who steadily follows series (no, not even those Disney cartoon series like the Rescue Rangers etc. ), but this series has definitely grabbed my full attention. The series that I am referring to is called Once Upon A Time. It is a new series which is currently still being aired in America. The series centers around a town called Storybrook. All the people who live in that town are characters from fairytale land who have been sent to the real world through a curse, cast by Snow White's evil queen. In the town time has stopped and no one is able to leave the town... If they try 'terrible things happen'. None of the characters (well... perhaps with a few exceptions) have any memories of their past lives in fairytale land; no memories of true loves kiss or even of a faithful bite in an apple. The evil queen has done everything in her power to prevent a happy ending for any of our favorite fairytale hero's and heroines. There is only one person that can break the curse; the only one that got away... The daughter of Snow White and Prince Charming. After reading my summary some of you might think that the story must be filled with clichés. The opposite is true. Many of the stories have been reworked and although I am a huge fan of the originals, some of them have become just a tad more interesting. Due to the many plot twists the story is completely unpredictable, causing you to be pleasantly surprised during almost every episode. The cast (the names will lead you straight to their IMDB pages) has some outstanding actors such as Jennifer Morrison (who plays role of Emma, the daughter of Snow White and Prince charming), Ginnifer Goodwin (Snow White) and Lana Parrilla (the, very, very convincing evil queen). Though the most superb actor, who really makes the show, is Robert Carlyle who plays the role of Rumplestiltskin. I can hear some of you think: Rumplestiltskin? That cannot possibly be all that special.... Well you would be surprised! As I said before, they reworked some of the stories completely and the story with perhaps the most impressive makeover is that of Rumplestiltskin. He has been turned into the ultimate bad guy; the puppet master who carefully manages the entire charade. He almost takes on the role of Satan: if you want your wish to be granted, you will have to give him something in return. For, 'all magic comes with a price, dearies'. This price can be a variety of things: your first born or maybe just your coat. 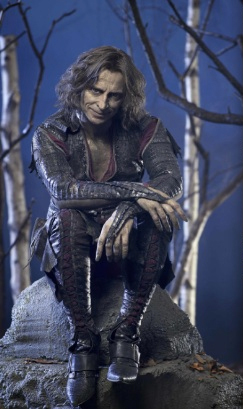 Upon first seeing Rumplestiltskin you will find yourself thinking: OMG this guy just freaks me out. O.o He is evil and completely mad! But the more you see of this character, the more you find yourself mysteriously attracted to him, even to the point that you can actually imagine why the other characters accept a deal with him. Throughout the series you will find out how Rumplestiltskin became the evil man he is now (for 'evil is not born, it is made') and you will gradually actually start to understand him, which makes him even more compelling as a character. (Urgh! It is so hard not to insert any spoilers, cause he is just so freaking awesome!). Well I hope that this review will have induced some of you to actually go and watch the series, because I really do believe that this show deserves a very wide fan base. If you wish to know where you can download the episodes, let me know in a comment and I will give you the link ;). Oh wow I'm totally going to watch it! :D You should! Let me know if I need to send you the link. I managed to get my best friend and parents hooked as well haha. Already watched the first 3 episodes! These series were made for people like you and me haha. Love it! Eigenlijk vind ik Rimpelstiltskin gewoon heel eng. Wat maar weer bewijst hoe goed ie speelt ;).